All hail the return of the beret! 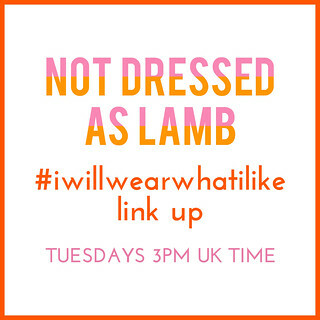 Not just in general, but back to the blog and back into my closet… I’ve missed them! As much as I love, love, LOVED the summer and all the easy dressing and lightweight dresses it brought, I did occasionally give my berets a thought and looked forward to the day I’d be getting them back out again. This week I not only got them back out again but I decided to buy my current ones a friend – may I introduce The New Pink Beret. I already have camel and mustard, so pink made perfect sense. And the reason why I’m loving berets even more than I did last winter is that I’ve gone and changed my hair. AGAIN. The bangs are back! And I love them peeking out from under a beret. 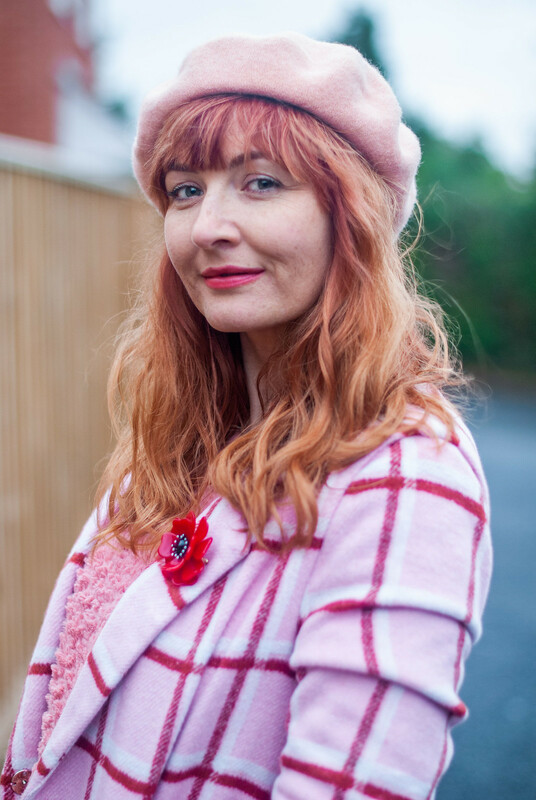 So the pink beret not only complimented my new fringe but it was also desperate to be worn with this pink check coat I found at New Look. As you can imagine the colours were calling my name; a couple of clicks later and it was on its way to me. I CANNOT control myself when it comes to check coats. It’s not lined so not exactly a warm and snuggly coat, but it was just right for the reasonably mild and drizzly day we had when we shot these pictures. 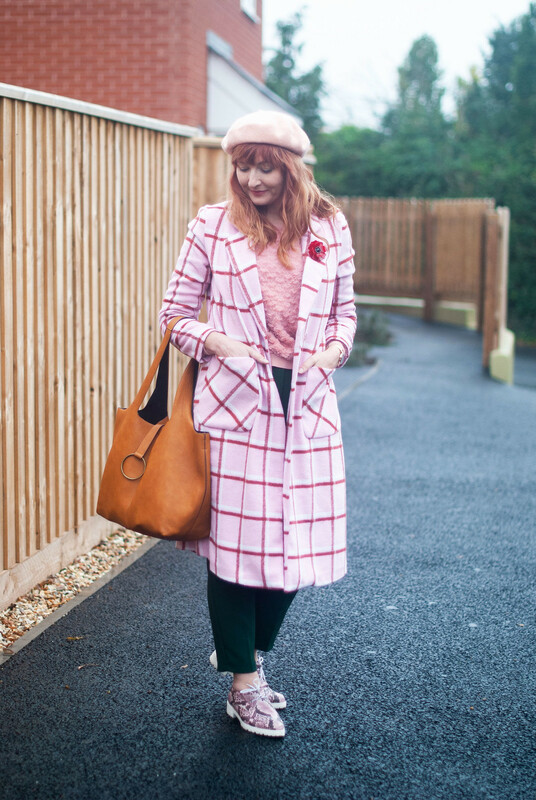 I’ve LOVED check coats for years (I wore one a couple of weeks ago on the blog) and this one is the perfect backdrop for my commemorative poppy – Remembrance Day is on the 11th and a special one as it’s the 100th anniversary of the end of WWI. I’m also having a bit of a green thing at the moment – these high waisted green peg legs are Asos and sooooo comfy. I love high waists for the extra tuckage they give you: so good for keeping your middle warm in cold weather! 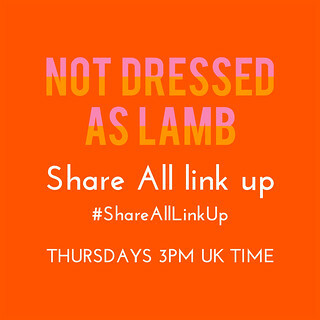 Please do add your outfits to this week’s link up – and if you’ve added a link to here or my button to your post you may be featured next week! DO YOU FIND THAT YOU COLLECT TOO MANY OF A PARTICULAR TYPE OF GARMENT (LIKE ME AND MY CHECK COATS)? TELL ME IN THE COMMENTS…! OTHER CHECK COATS YOU MIGHT WANT TO “CHECK” OUT…! Loving this so much! You’re like Valentine’s day meets Christmas with the pink and green! 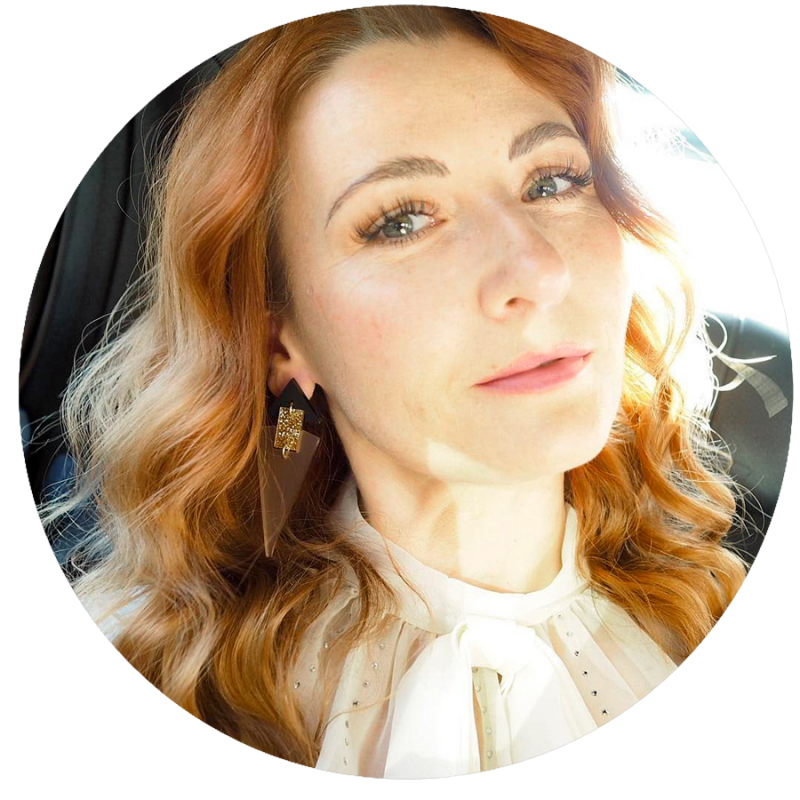 The pink is so lovely on you, so maybe you’re the one to ask, cuz this is something I’ve never understood (not being a red-head myself) – what is up with the “redheads shouldn’t wear red/pink” thing? It just came up recently in a conversation with a red-haired friend, she was asking about a red dress, I thought she looked amazing in it but she was holding fast to the above adage – so I don’t get it! PS – also dying for those shoes! I need some comfortable, well-arch-supported shoes that are a step above a sneaker. I keep thinking some sort of oxford and these are gorgeous!!! I really love that pink check coat, the colours are so pretty. I’ll have to avoid New Look as I have an addiction to buying coats, and must stop! love the beret, such a cool look. Berets are back, so the fashion people tell us, but we both never really gave them up did we?! As always, an inspirational and fabulous outfit. Looking good. You have a face shape which can carry a hat, I really struggle to find one that suits. With my daughter’s wedding in September I had better get searching now lol. Love reading your posts. Catherine, this pink coat has me in a swoon, for sure. So pretty! And I love your hair with bangs. As a beret lover myself, this is a look I would totally style as well. I need to get out all of my berets now that the weather has turned cooler. I have worn a few this season already, but I have so many others that need to be shared! Baby pink and sage green, another new found combination for me Catherine and how lovely that works. I must admit that checked coat is rather me too, oh dear! Well done with the fringe, and yes it’s all very youthful. Thanks for the link-up. Am a bit rusty at this so my linking and title wasn’t as smooth as I’d hoped for, but it’s great to be back. P.S. You can always delete what you’ve linked up and start again if you’re not happy with what you’ve put! 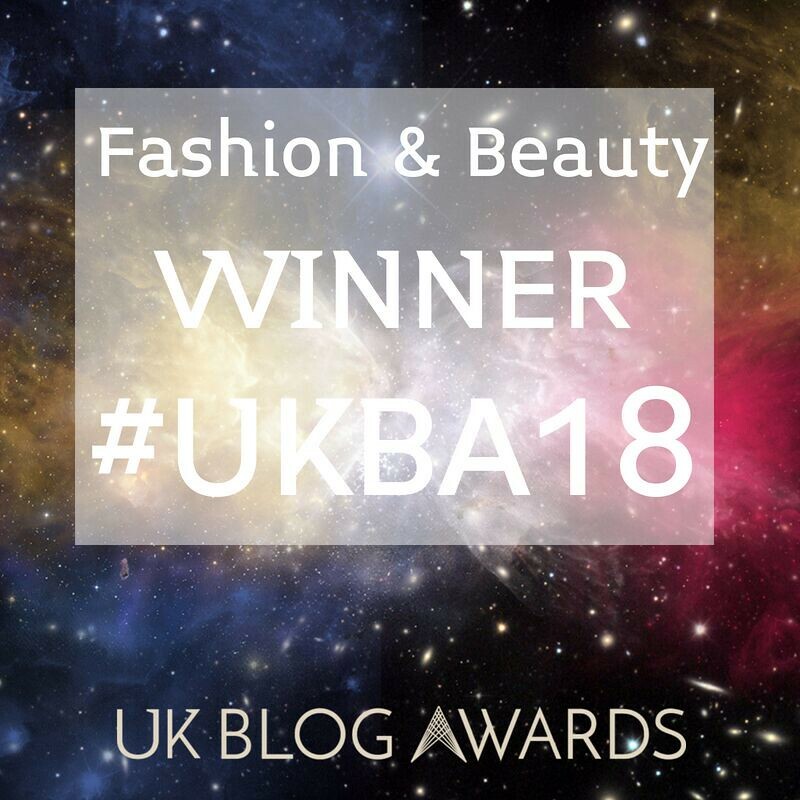 Thank you Maria – I get to wear them completely different with a fringe! Hehe thanks Cheryl – let me know if you go for the chop…!! You really suit a beret and the pink check coat is so cute! 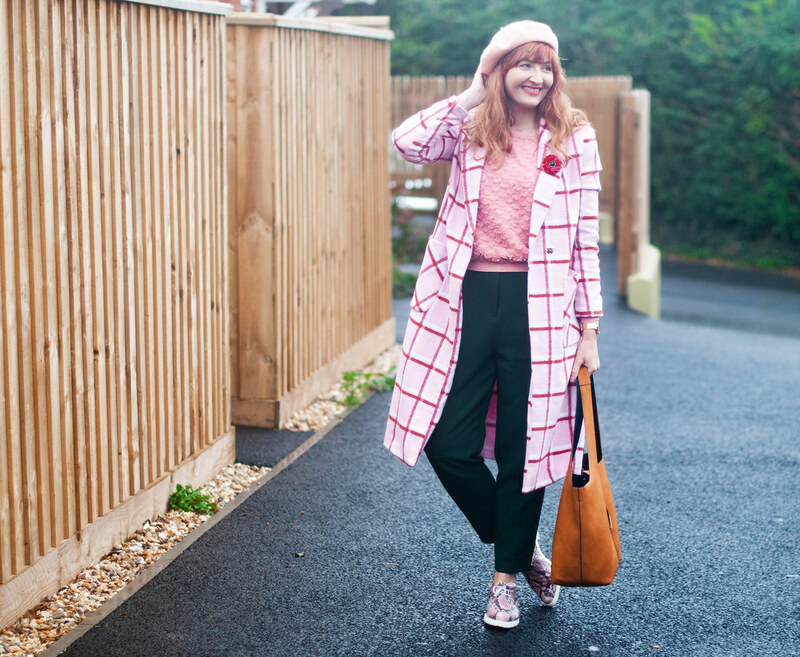 I love that you’re wearing pink in the colder months—all hail for pastels in the winter!! 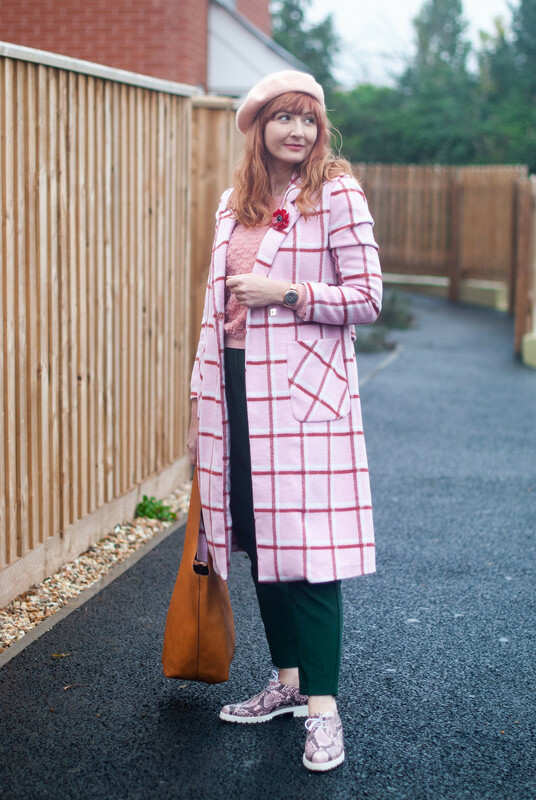 Love the pink checked coat. I’m loving all the plaid and check going an right now and that pink color is great. the beret looks great on you. I love hats in theory, but I tend to buy them, but then never wear them. Love the fringe, I too often think of growing my fringe but I am afraid of the fact that long skinny face is not always the most attractive look on me. 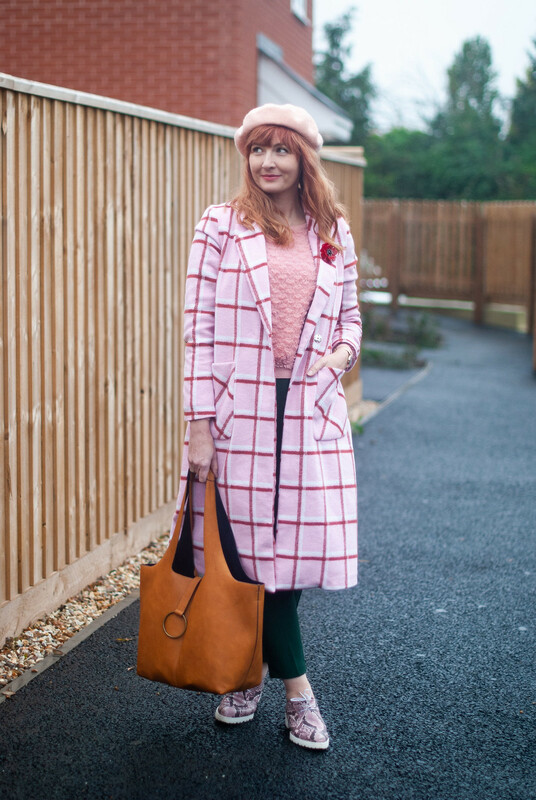 I adore the coat and the pink beret.